By hungry runner on November 21st, 2012 . Filed under: Crafts, Holidays . If you’re looking for a craft to do while your family is together this mini cupcake tin advent calendar seems like a great project. 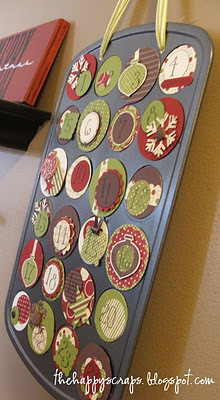 The Happy Scraps shared her homemade advent calendar and 24 activities ideas for each day. So instead of opening a little present or putting together a little Christmas display you do something as a family each day leading up to Christmas. I think this is a really nice, and different idea for creating new holiday traditions.